To start, they’ve got my name wrong. While I get called David often and rarely notice it, when you’re sending a cold email, it’s nice to get the name right. If this were the only error, I’d be able to get past it. In their positioning they say, “report significant increases in audience engagement, brand reach and advertising revenues.” What’s that mean? If you’re going to make a claim such as that, give data. Otherwise I think you’re just being a salesman. The reference customers they use demonstrate that they know nothing about me. The call to action is weak. No promises (I get it, they’re trying to be humble; but it doesn’t fit with the rest of the content). Why should I interrupt my day (or someone else’s) to talk with this person? There is absolutely no value whatsoever parlayed in this email. I’ve learned nothing, see access to nothing and realize that if this email is such a waste of time, a phone call probably will be as well. So, what’s wrong with this email? Everything from my list above. Once again there is no value whatsoever in this email. I’ve learned nothing about my situation, nothing about what the company brings to the table, and nothing that would indicate spending any time with this person would help me in any way. Seriously? Three emails over a two-week period and I get this email? Look, I’m a fan of the break-up email. It’s one of the most effective emails we use, and yes, we often use humor in the email. But, two weeks and three emails? The data shows that it takes 8 – 12 attempts on average to connect with someone and they’re giving me the “I guess we’re out of touch for three reasons”? They gave me three reasons, and there’s at least a fourth one. That is that I do not have a need for their product at this time. 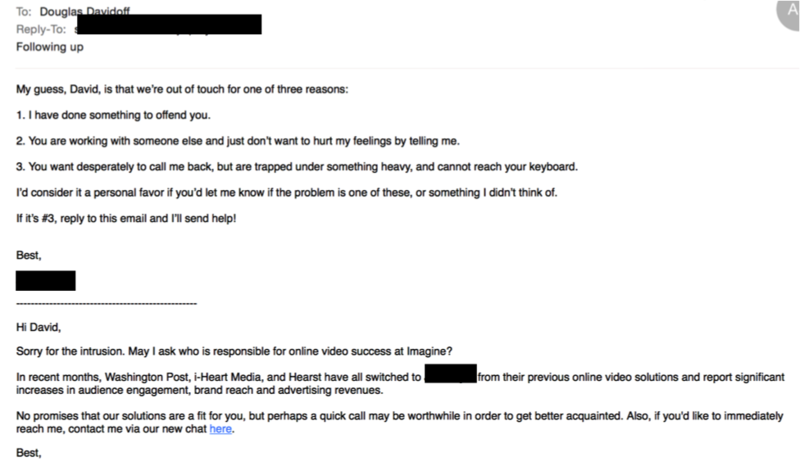 I realize that that response doesn’t help their conversion, but it does demonstrate the empathy that a break-up email is supposed to convey. They try to use humor when they haven’t earned the right. They don’t ask for an honest response. A good break-up email gives me permission to say that it’s not appropriate and the only option they actually focus on is the one that would involve us talking. They’ve done nothing other than send me three emails. No phone calls, no social connections, nothing. If all you’re doing is sending out emails and waiting for responses (especially to ones written like these)…good luck! You might be saying that I’m being picky with my comments, and that would be a fair characterization. However, when you’re designing outbound lead generation programs the little things matter… A LOT!! Think about it this way. If a company is currently succeeding 5% of the time with their emails (and these types of campaigns probably aren’t), for every one-point improvement you increase the yield by 20%. With the tweaks that I share below, we’ve been able to increase quality lead populations by more than 100%. If this company were talking to me about how to improve the results of their efforts, here’s what I would tell them. The first thing that is clear with most outbound emails I get is that they have no idea who they want to communicate with. This is why so much of the content created is vague and boring. By taking the time to create clear personas you can create emails that have a much better chance to connect, influence and create the action you desire. Value creation is binary – you’re either creating it or you’re extracting it. The emails I shared above extracted value. 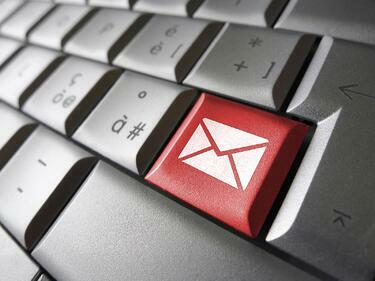 Craft your emails to educate your prospect on a problem or how you solve it. This doesn’t mean you should make your emails long, but you need to communicate why and how an action taken by the prospect will benefit them (even if they never buy from you). Full disclosure, the error I shared in the beginning about my name is a really tough one to solve because it’s highly dependent on the data you’re using to create the list. The reason I shared it was to point out the absolute importance that needs to be placed on the data you’re using to create your lists. We make mistakes with lists, as does every other organization on the planet that does successful outbound lead generation. However, we spend hours (and more money than I care to admit) on improving data quality and cleaning lists. This step is absolutely critical to a successful campaign, and it’s often skipped to save time or money. When your prospect receives your email, they should feel like it was written for them. You should also provide at least one other way to advance the process. For example, a PS sharing a white paper on what creates effective video engagement would have been very interesting and I may have clicked on that. A lot of prospects aren’t ready to put themselves (or a peer) in front of a salesperson. They may want to learn more about you or the issue you solve to make them more comfortable. Let them do that. Occasionally, a highly effective email will create enough of a positive response that you’ll be able to meet your goals simply by working the positive responses. However, that happens far less frequently today than it did even a couple of years ago. Research from TOPO highlights the importance and value of multiple modes of contact. The only reason to not integrate phone into your campaigns is because you can cover far more people without it. However, in the vast majority of cases, you’re far better off reducing the number of contacts you reach while integrating phone calls. Making this work requires that you have valuable content. If your outbound calls are only about setting appointments then all you’re doing is smiling and dialing. With valuable content, your outreach can be focused on helping, rather than closing. The length of time and the number of touch points used is highly dependent on the industry you’re in, what you’re selling and who you’re selling to. As a rule though, more tends to be better; and most companies don’t do enough. We put a prospect through a campaign that runs 6 – 12 weeks and involves 12 – 20 touches (combining email, phone and voice mail). In highly directed campaigns, we’ll also include social connections as a means to increase conversions. Implementing successful outbound lead generation campaigns isn’t easy. It requires a lot of work and attention to detail. The upside is that it can increase your qualified lead population by as much as 1,000%; so it’s well worth putting out the extra effort to do it right.